Through a collaborative effort between BDS Suspension and Fox Racing, BDS now offers this 4-6" Dodge 1500 4WD suspension system featuring Fox 2.5" coil-over remote reservoir shocks. This system has been rigorously tested to maximize travel and performance on and off the pavement. For 2013 Dodge added an electronic steering rack which uses different tie rod ends. 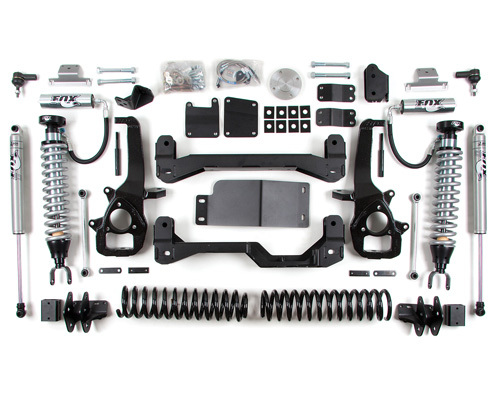 BDS has you covered with a new 4-6" coil-over lift kit specifically developed for your 2013-2018 Dodge 1500 truck. This lift kit is based around two one-piece, 1/4" laser cut high-clearance crossmembers and replacement steering knuckles. The high-clearance crossmembers increase ground clearance for off road performance and on road appeal. The replacement steering knuckles make for a clean installation as well as maintain proper steering angles and ball joint angles. A differential skid plate is included for off road protection. The system also includes bump stop drops, anti-sway bar links, 3 point differential drop system, strut relocation brackets, and front stainless steel brake lines. Nothing complements this BDS Suspension better than the race proven design of Fox 2.5" remote reservoir coil-over front shocks. These have been specifically engineered to fit the BDS Suspension system and feature an external reservoir for increased oil cooling capacity and nitrogen volume for a more consistent and comfortable ride. These have also been pre-set by BDS to 6" of lift for an easy installation, but can be adjusted down to 4" or fined tuned anywhere in between to your liking. BDS allows you to customize your desired stance by offering 2" rear coil spacers or 3" and 5" Pro-Ride coils that are capable of being smashed totally flat and will come back to normal ride height. The rear for this Dodge Ram lift kit is completed with a track bar bracket, upper link relocation brackets, and sway bar links. BDS by Fox 2.0 series rear gas shocks come standard to match the front 2.5" Fox Coil-overs. 1. Not recommended for AWD models. 2. Stock 17" wheels cannot be re-installed. Stock 20" can be reinstalled with factory tire.